To get started spinning your own fiber, you need a medium-weight hand spindle and 1⁄2 pound of medium (curded) roving — Corriedale, if possible. You also need 18 inches of commercial two-ply yarn. You use this yarn, called a leader, to connect the spindle and the fiber. You must attach the leader snugly to the spindle with a slipknot. 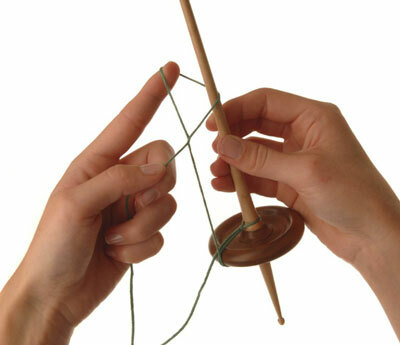 Hand spindles make yarn by twisting fiber into thread. These tools are as simple as a stick and a stone. 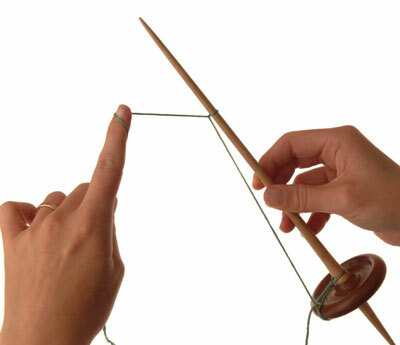 By twisting the spindle (the stick), you add the twist to the fiber. The whorl (the stone) is there to add weight to the spindle. This extra weight makes the spindle twist longer, thus producing more thread. 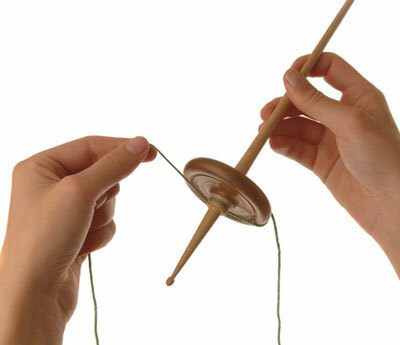 You can use a hand spindle in two ways: as a drop spindle or as a supported spindle. You hold a drop spindle (a) in the air. The weight of the spindle moves it toward the ground, and the yarn forms as the fiber is drawn toward the spindle. You place a supported spindle (b) on the ground. The yarn forms as the fiber is pulled up and away from the spindle. There are three main types of hand spindles: low whorl, mid-whorl, and high whorl. 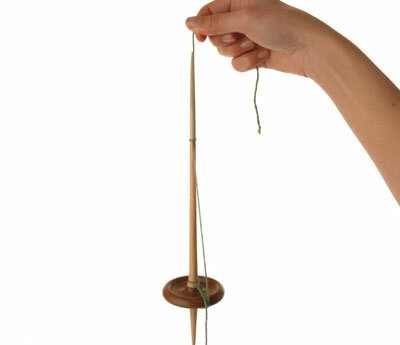 Low whorl: You can use a low-whorl spindle (also called a bottom whorl) as a drop spindle, hanging in the air, or as a supported spindle, with the point of the spindle resting on a flat surface. Low-whorl spindles come in many sizes and spin both thick and thin yarn. They spin any type of fiber. These spindles are found across the globe, and they’re still in regular use in many countries, including Turkey and Peru, and on the Navajo Reservation. Spinners use low whorls to make yarn for Persian carpets, Navajo rugs, and fine silk shawls. Mid-whorl: Mid-whorl spindles are usually small and lightweight. Used for spinning fine thread, they are perfect for spinning cotton, cashmere, and other soft fibers. Spinners in Indonesia commonly use mid-whorl spindles to create silk and cotton thread for weaving. High whorl: Probably the most common spindle used in America, the high-whorl spindle (also known as a top whorl) dates back to early Egyptian times. You can use it either suspended or supported, to spin medium to fine fiber, and to spin a wide range of diameters. For your first spindle, keep your options open. Choose one that can be used in a variety of ways—either drop or supported, high whorl or low whorl. 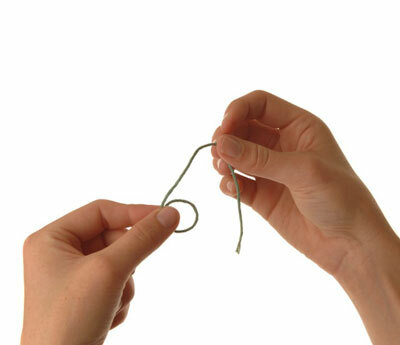 Use two simple knots to attach the leader to the spindle: first, a slipknot and then, a half-hitch knot. First make the slipknot. 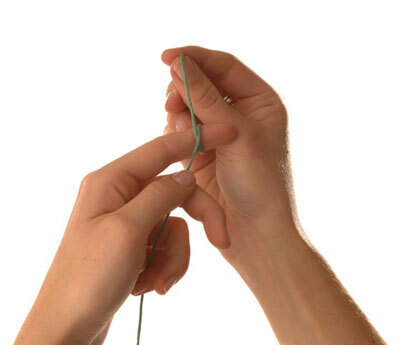 Take the two-ply yarn (a single strand will come apart as the spindle turns) and wrap it around your finger so that the long end crosses the short end. 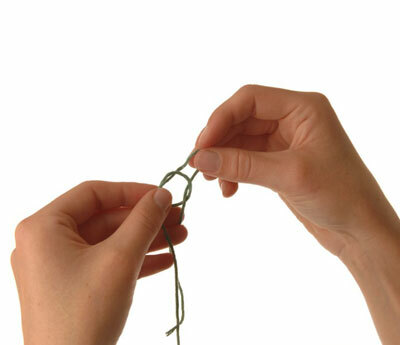 Slip the yarn off your finger and hold it between your thumb and finger. Pull the long end through the circle as a big loop. Slip this big loop over the shaft of the spindle and slide it down to the whorl. Pull the loose end to make it fit snugly. Wrap the long end of the leader around the bottom of the spindle several times. Bring it back up the shaft and make a half-hitch knot. Next, you make a half-hitch knot. Some spindles have a hook at the end. If your spindle has one of these, you do not need to make a half-hitch knot. Instead, simply run the leader through the hook. Make a loop with the loose end on top of the leader. Hold it between your fingers. Turn it over so that the leader is now on top. Slip the loop over the top of the spindle shaft and pull it tight. The spindle should be able to hang by the leader.